Curiosity And The Search For Life On Mars : 13.7: Cosmos And Culture NASA's Curiosity rover will soon begin to search for signs of life, past or present, on the red planet. But can we make sense of life in strange places? And if we don't find it, what will it mean to us? A network of valleys believed to have formed by water erosion enters Mars' Gale Crater from the outside. 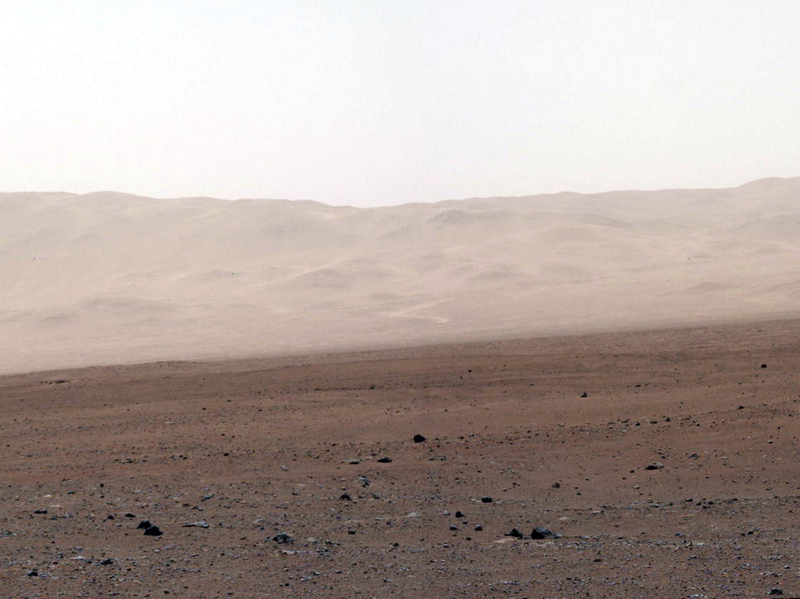 This image of the crater wall is north of the landing site, or behind the rover Curiosity. Only those who were in deep hibernation or unconscious would have missed two recent amazing events: the London Olympics and the sensational feat in which NASA engineers and scientists managed to land a car-sized rover onto the Martian surface. Adam wrote about the mission last week. Now that the dust has settled (in many ways, including around the rover), I'd like to revisit the mission and its promise of discovery. After years of preparation and 8 ½ months of travel, Curiosity was deposited near Gale Crater, in an area that looks like the Arizona desert. (But it's not, so no deniers, please! Let's celebrate humanity's achievements for what they are.) That the rover landed safely and on target, after using an amazing-looking parachute and a "sky-crane" device to soften the touchdown, was nothing short of wonderful. Remember, it was all done remotely, commanded by onboard computers following a 500,000 lines-long code. And I thought my 3,000 line-long codes were plenty long. Then there was the "seven minutes of terror," the time it took Curiosity to land. Since communications from the rover take about 14 minutes to reach the base on Earth, the landing had to be done automatically: A very sophisticated robot landed on Mars by itself. Its main objective? To find life, present or past, on the Martian surface or below. The rover is an ultra-sophisticated moving chemical laboratory. Some of the first pictures can be seen here. You can get more up to date pictures by following the rover on Twitter, @MarsCuriosity, which had just under 1 million followers as of this writing. 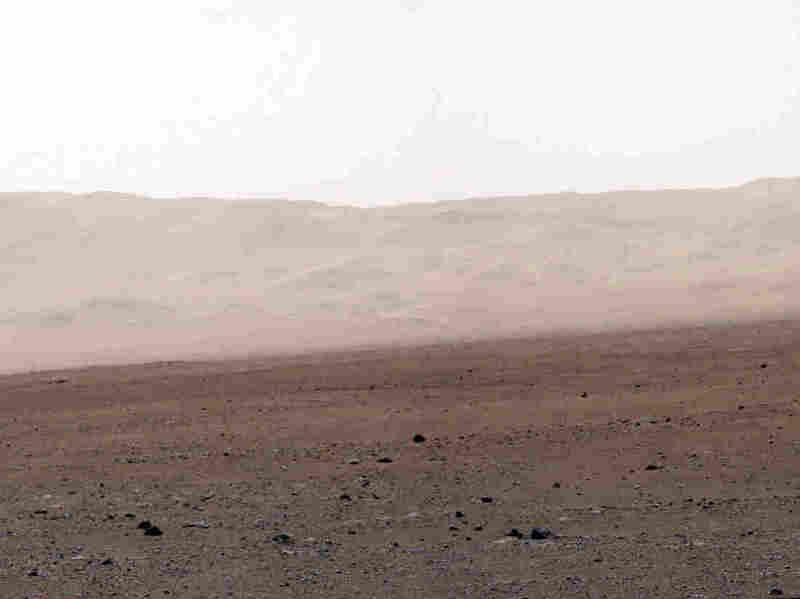 Mars around Gale Crater is dry, cold, prohibitive. NASA images show small pebbles scattered around the surface. 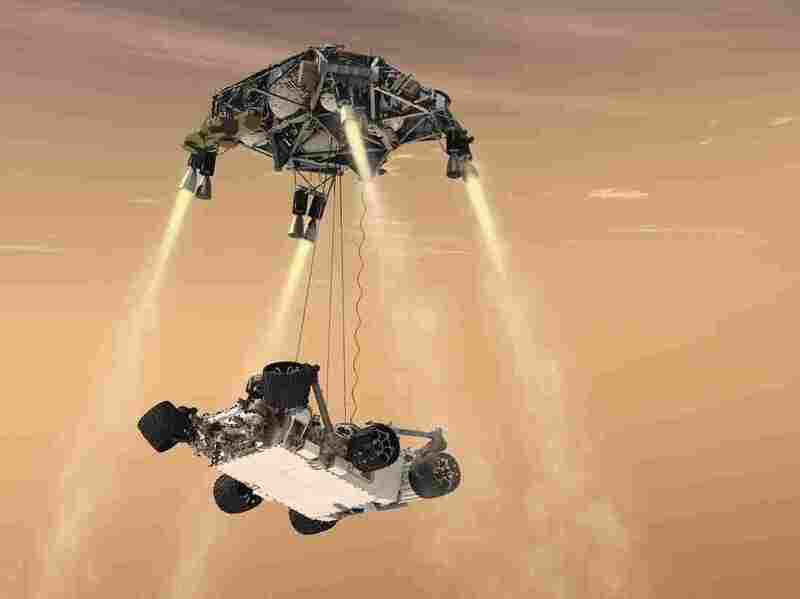 When Curiosity starts moving in about 10 days, it will collect samples from the soil and underneath, searching for traces of organic matter or any signature of metabolic processes typical of some kind of life, either present or from the past. One of its neat devices is the ChemCam, which uses a laser to vaporize bits of soil up to 23 feet away. The vapor can then be analyzed with a spectrograph to determine the composition of the zapped minerals. The Mars of today, with a very sparse atmosphere mostly composed of carbon dioxide, is very different then it was billions of years ago. Studies of the Martian geology and the recorded movements of water across its surface — there are plenty of dried up canyons crisscrossing the landscape — suggest it's highly probable that while Earth was still a living hell of lava and volcanic eruptions, Mars was wetter and far friendlier to life. The expectations are high that Curiosity will find a trace of life, even if long extinct. However, if results turn out negative, we will still learn a lot. After all, the question we are asking is whether life on Earth is the exception or the rule. If life is not found on Mars, it will be harder to justify that life is abundant in the universe. Of course, life may be there or may have been there and completely escape our methods of detection. If finding life on Earth is easy, it may be much harder in other places. Not because life can be way too weird for us to even identify it. That can happen, of course, but it's a real long shot. Carbon-based life has a much richer biochemistry than any other possibility, including silicon, an often-mentioned alternative. Also, water is essential; ammonia as a solvent is far from being as efficient as water. Even if there isn't a universally-agreed definition of life, and some argue quite forcibly that it's a mistake to try to define it, the one NASA adopts is very general: "Life is a self-sustained chemical system capable of undergoing Darwinian evolution." Life is defined through its metabolism and ability to reproduce itself. It isn't perfect, but it's what is called an operational definition. Time will tell if Curiosity's experiments will give us a hint of what the story is with Mars and life. Short of detection, there's always room for more search: Science works better at finding out what exists than at ruling out what doesn't. (As long as it satisfies the laws of physics, chemistry and biology, of course. But even so, the possibilities are amazing.) Meanwhile, the least we can do is realize how lucky we are to be living in an age when we can actually go to the Red Planet and see for ourselves — or through a worthy emissary — whether we are the only living creatures in our solar system.